This pencil holder can be used as toiletry organizer that works great as a mini travel kit, men's shaving bag, women's makeup bag, or electronics organizer. It works well for kids' toiletry item during travel and at home. Really big capacity inside, center plate one can hold children's activities like calculator, compass even small toys etc. It is very big pencil holder for kids in school and suitable for children toiletry items at home also and can be used as storage bag for baby for carrying suitable feeding bottle with other small items when go outside. 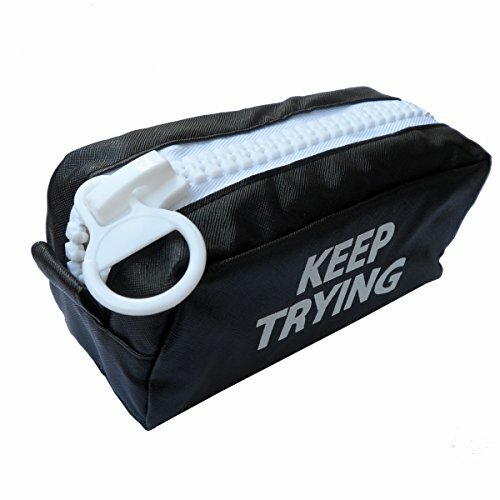 "KEEP TRYING" just like our effort in life but also for trying to put more items inside. It is a good gift to your kids or friends and yourself. Unit is sold as single Pencil Case. Pencils or other items (pictured) are not included. If you are not satisfied then contact with us freely as we guarantee money back or replacement or other solutions which you prefer.